The 380-43408 Motor Aspirated Radiation Shield provides maximum sensor protection from incoming short wave solar radiation and outgoing long wave radiation. The shield employs concentric downward facing intake tubes and a small canopy shade to isolate the sensor from direct and indirect radiation. 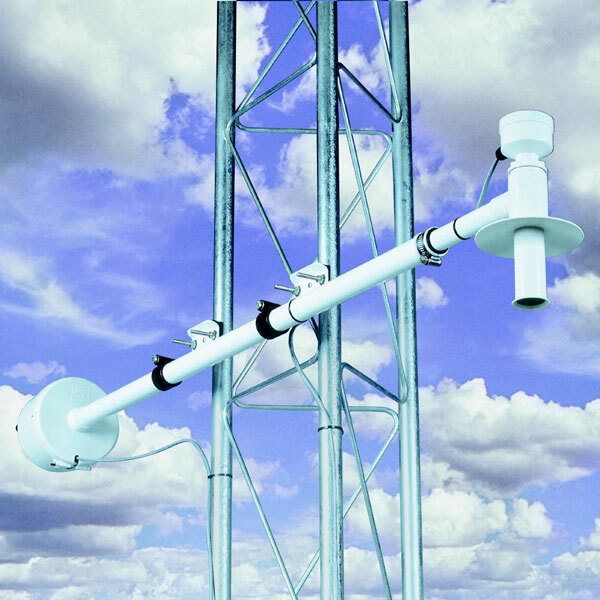 The 380-43408 Motor Aspirated Radiation Shield provides maximum sensor protection from incoming short wave solar radiation and outgoing long wave radiation. The shield employs concentric downward facing intake tubes and a small canopy shade to isolate the sensor from direct and indirect radiation. A continuous duty blower draws ambient air through the intake tubes and across the sensor minimizing heat transfer to the sensor. Compact shield components reduce radiation absorption and improve aspiration efficiency. Specially selected plastic materials provide high reflectivity, low conductivity, and maximum weatherability. The versatile DC blower is designed for continuous duty of 80,000 hours at 25°C. Brushless electronic commutation is achieved using dependable solid state circuitry.